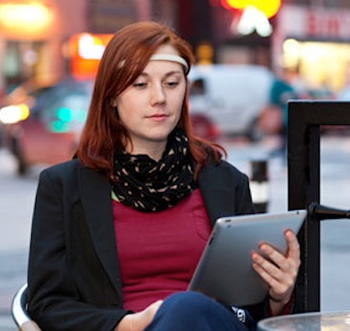 At LeWeb 2012 today, crowdfunded startup InterAxon announced plans to begin selling Muse -- its brainwave-sensing headband -- to consumers in spring 2013. For anyone interested procuring a Muse of their own, they'll have until December 7 to make a contribution to the startup's Indigogo crowdfunding campaign. Currently, offers of $135 or higher will guarantee contributors at least one headband of their own when the device finally ships. Interpreting the electromagnetic waves radiated by human grey matter is not a new concept -- we've been hearing about this type of technology for many years. In fact, InterAxon itself has been around since 2007. However, the company hopes its futuristically-stylish, mind-reading headband will be the first commercially viable device to peer into the minds of men (and women). For now, the company is focused on Muse being a useful brain training tool. The headband is able to tell, amongst other things, when wearers are intensely focused, feeling relaxed, glowing with happiness or floundering off task. As an example, InterAxon says if wearers use Muse to provide cues when they lose focus on important tasks, it could be a valuable tool for developing better productivity habits. Despite its billing as a sort of brain trainer, interacting with the environment is certainly not beyond the reach of Muse -- the startup has demonstrated mind-controlled objects, thought-driven games -- and interestingly enough -- offers the largest contributors a rockin' party complete with mind-controlled beer tap. InterAxon says over the next 10 years, it'll be focusing on brain-controlled toys, games, lightning and more. Currently, mentally manipulating objects with Muse is something that's still in its infancy. The headband features four sensors at the front, a couple of sensors near the ears and is able to interoperate with other devices (e.g. tablets, smartphones) via Bluetooth. The device is "easy to wear" -- thin, light and flexible -- and is expected to launch early next year for just $199.